Queensland currently is only one of two states in Australia where abortion is a crime. At the time of going to print, the Queensland Government was in receipt of the Queensland Law Reform Commission (LRC) report into the decriminalisation of abortion in Queensland, and had limited sitting days in the current term of Parliament to consider its recommendations. It is anticipated that the ALP will allow its state MPs a conscience vote, however the LNP indicated that it would wait to see any proposed legislation before taking a position. Early in 2017 a bill to decriminalise abortion introduced by Rob Pyne was withdrawn, and the Attorney General Yvette D’Ath referred the matter to the LRC. Public submissions were invited, and the QTU, along with other trade unions, provided one. Our submission was based on long-standing QTU policy regarding a woman’s inherent right to body autonomy and access to free, safe healthcare, no matter where she lives. Nearly every community throughout Queensland has a school. Our coverage as a union is truly state-wide. Our members work closely with parents, children and young adults in all communities, including those most disadvantaged and remote. We believe that the current legislation unfairly and unreasonably restricts access to safe terminations, and that remote and impoverished women are disproportionately impacted. Access to appropriate and timely healthcare should not be dependent on where you reside. The sad reality is that limiting access to safe terminations results in horrific health consequences, as well as impacting on financial and emotional wellbeing. 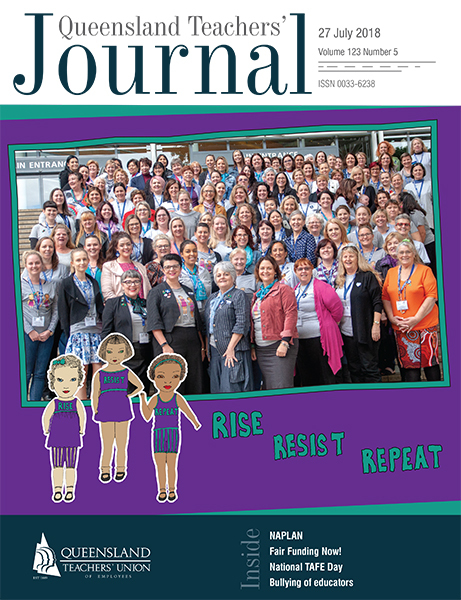 The QTU has stood proudly with other unions, community groups and activists to send a strong message that the current laws, written in 1899 before women’s suffrage, are no longer relevant in a modern Queensland and, importantly, do not reflect the views of Queenslanders. Children by Choice’s website cites a long list of respected research into public opinion on abortion, and it is widely recognised that over 80 per cent of Queensland adults support a women’s right to choose. (https://www.childrenbychoice.org.au/factsandfigures/attitudestoabortion). Further, it is strongly hoped that new legislation will also include safe zones for health clinics where terminations are performed. Health workers and patients are routinely exposed to abuse and harassment from anti-abortion campaigners in and around buildings and surrounding streets. This is simply not OK. Everyone deserves the right to safety at work, and women have the right to access healthcare without threats of violence or abuse. QTU members have been invited to speak at rallies at Parliament House, we have attended street pickets, written submissions and escorted women to clinic appointments to shield them from abuse and harassment. There are women in our communities who have been actively campaigning for abortion reform for over 40 years. Please talk to your local MP. There are long-held and religious views on this sensitive issue, but no MP should be in any doubt of the support from their community for decriminalising abortion in Queensland. One only needs to look at the tremendous result in Ireland’s recent referendum on abortion laws to know that the world has truly moved on from 1899. I sincerely hope that Queensland will too.